For some reason street names get changed. But sometimes the previous name is still visible on an old sign. Shown here are a few examples. 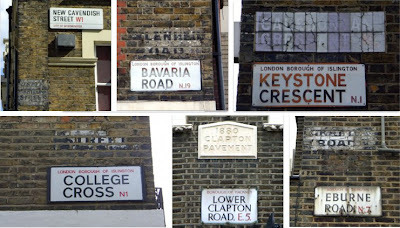 New Cavendish Street, W1, was Upper Marylebone Street; Bavaria Road, N19, was Blenheim Road; Keystone Crescent, N1, was Caledonian Crescent; Eburne Road, N7, was Grafton Road; in 1880 a stretch of Lower Clapton Road, E5, was Clapton Pavement; College Cross, N1 was (something) Street. I will look into the last one and see if I can source the previous name in full. College Cross used to be called College Strret. In the early 30s it was College Street. In answer to your 'why did they do THAT? ', I understand that the plan when they added numbers to postcodes was that there wouldn't be two streets with the same name in the same postal district. From about 1936 to 1939 many streets were renamed. But there my logic falls down, as there isn't another College Street in N1 or anywhere nearby.